Since the early 1900s, the State of Florida has invested billions of dollars in changing and then in restoring the Everglades water flow. The impacts of climate change and sea level rise pose a challenge to the Everglades ecosystem and add urgency to accelerate the restoration of freshwater before any unpredictable change in the future. Going back in time, the water issues in the Everglades date back to the late 1800s, when portions of the Everglades were drained to provide additional dry land for a fast-growing population in South Florida. 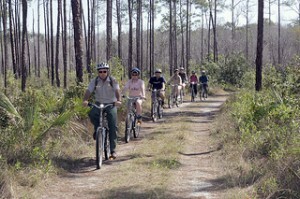 People bicycling along the Long Pine Key Nature Trail in Everglades National Park (Photo courtesy of National Park Service). A deadly hurricane in 1928 worsened things because it caused massive floods in the area. The U.S. Army Corps of Engineers responded by constructing a network of canals, levees and water conservation structures that eventually succeeded in controlling floods and providing water supply for urban and agricultural development. However, these new constructions caused unpredictable environmental damages to the greater Everglades ecosystem. “The idea at the beginning was to control the floods after two consecutive wet years in Florida, but unfortunately, we started to get salt intrusion in the dry season,” said Harold Wanless, a geological science professor from the University of Miami. 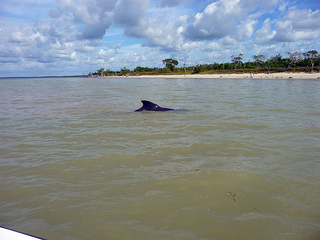 It was not until the 1950s that this environmental disaster was recognized and ever since the South Florida Water Management District, U.S. Army Corps of Engineers, National Park Service and several groups of environmentalists have been working together for the Everglades’ restoration. A whale swims in waters of Everglades National Park (Photo courtesy of National Park Service). “We dried up a part of the Everglades with the best intentions and the best ideas; we didn’t attempted to screw up the Everglades. Fortunately, we soon realized the unintended consequences and we’re trying to correct them now,” said Eric Bush, U.S. Army Cops of Engineers Planning and Policy Division Chief. The remaining Everglades have been reduced to half of its original historical size. “We are looking to a shocking statistic of water levels between 1960 to 1992 and even the bird population decreased by 90 percent, because we got the water delivery wrong,” Wanless acknowledged. The Everglade’s water of today moves through a maze of canals, levees, pump stations and hydraulic control structures. A big part of the water is polluted by phosphorus and other contaminants that come from agricultural activities. 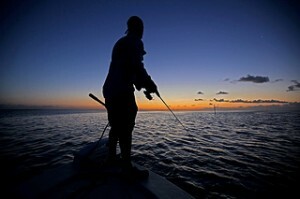 “There is quite a challenge in the restoration of the Everglades. The only way to save water is getting a place to store water that we aren’t using so we can store it and release in the dry season; and that way the Everglades is not going to dry out so badly. But we haven’t find a place to build a water storage, that’s the problem,” Wanless said. “Another issue with saving extra water is that extra water is always flood water and flood water is always polluted, so you have to actually clean it before you put into the ground. It’s not that easy “ Wanless added. Click on the video at the right to view an audio slide show about restoration of the Everglades prepared by writer Katherine Fernandes. Fires have been nothing new to the Everglades. However, these fires have increased tremendously after the water distribution issue. Before, water levels lowered in the dry season, provoking small fires that just burned off the top of the soil routes. Now, with the water levels so low, fires are bigger and routes burn off deep into the organic soil, causing irreversible damage to the soil. Unbelievably, the restoration of the Everglades has been the largest hydrology restoration project in the American history. The most important approach to this restoration plan is the Comprehensive Everglades Restoration Plan (CERP), a $13.5 billion project that is using the best available science to restore the right quantity, quality, timing and distribution of freshwater and reversing the ecosystem’s decline. It is important to understand that no restoration program will make the Everglades look as it was before engineers created flooding control projects. A man fishing in Everglades National Park (Photo courtesy of National Park Service). “We can’t restore the size of the Everglades, but we can restore the function in the remaining natural areas,” Bush said. “Our plan is to take the remaining Everglades and turn it into a more natural and organized water distribution system,” said Larry Perez, science communications liaison for the South Florida Natural Resources Center. CERP managers have many projects in mind in order to restore a semblance of Everglade’s original size and pre-drainage patterns. Many individual CERP projects are being designed and are underway while others are being studied by the Congress before their funding is approved. The Kissimmee River restoration project is an example that the U.S. Congress already approved. “We’re working on filling up the canals up north in the Kissimmee River to restore more natural flow to the river and also to increase the water storage capacity of the Kissimmee chain of lakes, ” Bush explained. Another restoration project was elevating a portion of the Tamiami Trail, U.S. 41, which crosses the Everglades and connects Tampa and Miami. 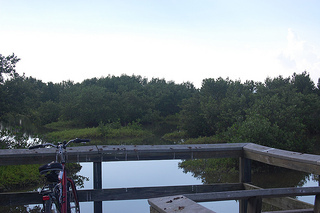 The bridge was constructed in western Miami-Dade County, and forms a portion of the northern boundary of Everglades National Park. Thanks to this project, more fresh water has been able to flow through what author Marjory Stoneman Douglas called “the river of grass” and to Northeast Shark River Sough in the national park. Restoring the natural flow to Biscayne Bay and Biscayne National Park has been another critical restoration project, which has been submitted to Congress for funding but not given an answer yet. Unfortunately, saving the Glades is very expensive. Due to the limited funding, all restoration projects cannot be performed at the same time. For this reason, the Everglades water is in big threat because the sea level is rising much faster than restoration programs are being completed. This presents a hard decision-making process for engineers in which they have to decide what projects will have the greatest potential and most valuable impact on restoration. “We’re in a time of sea level rise because of the global warming. We could have as much as six or more feet of sea level rise by the end of the century. We have to build up freshwater levels and organic soil at a fast enough rate so we could probably be enhancing the Everglades and prevent the sea level rise,” Wanless observed. The CERP provides scientific information about possible impacts of climate change and sea-level rise while projects are being constructed. “We have a very extensive monitoring program and we have scientists looking at ecosystems indicators such as key species, water quality patterns, chemistry patterns and changes in our implemented projects. This monitoring program provides us the conditions of the ecosystem and tells us if we need to modify or change the operating plan,” Bush said. Snake Bright, Everglades National Park (Photo courtesy of National Park Service). According to the 2014 System Status Report of the Comprehensive Everglades Restoration Plan, scientists observed altered hydrology and degraded ecology, posing a necessity for other restoration projects to accelerate their development. The report also portrayed the success of completed restoration projects such as the C-111 canal (South Miami-Dade), Biscayne Bay, Coastal Wetlands projects, Picayune Stand restoration and Central and Southern Florida project. The funding for CERP is about $100 million per year, which is a low budget for such a big restoration task. Accordingly, this will delay the restoration for approximately four more decades. According to a report from the National Research Council, availability of funding, inconsistency of Water Resources Development acts and procedural and policy restrictions have impeded some CERP project implementations. “If there is no change to the way the water is managed right now, the water will continue to stay thirsty and what that means to the Everglades is more severe wild fires, lost of soil and lost of wildlife,” Perez said. It is important to take the Everglades restoration seriously and accelerate the progress because with polluted water at critical seasons and in the wrong quantities, the Greater Everglades will continue to have irreversible degradation and eventually die.